Peking University is the top higher learning institution in mainland China. It is also the first modern national university established in the country, founded in 1898 replacing the old imperial academy. As I mentioned before, the purpose of my trip to China was to participate to a scientific meeting. 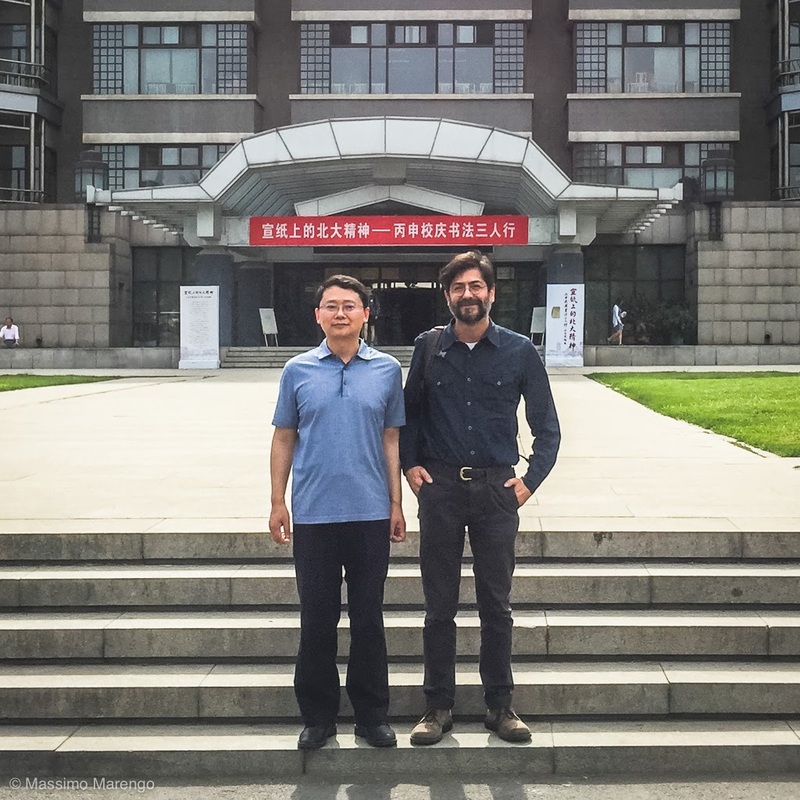 The meeting was not in the University, but was organized by the Kavli Institute for Astronomy and Astrophysics (KIAA), which is located in the campus of Peking University. 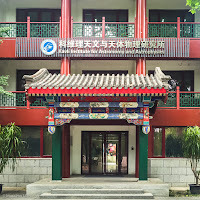 The institute occupies a modern building made in a traditional style (photo on the left), situated next to the pond in the photo above. 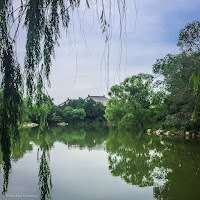 The University campus is on the former site of the Qing Dynasty imperial gardens, and is an attraction in itself with the numerous traditional style buildings, pagodas and manicured gardens. 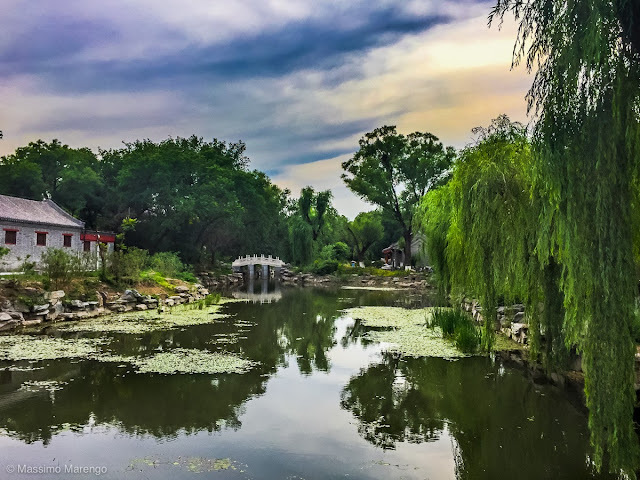 The central Weiming lake is very beautiful, and is surrounded by many walking paths, smaller gardens and ponds, and there are several museums that are worth the visit. The campus is very popular, and there is a permanent line of tourists at its main gate during the security check before entering the grounds . If you want to visit the gardens in your next visit to Beijing it is well worth it, but remember to bring along your documents to gain access (that is true for all touristic attractions, including the Forbidden City and the National Museum). I actually managed to avoid the line at the entrance since I was accompanied by a colleague of mine that works at KIAA, one of the organizers of the conference. He is from the Netherlands and a few years back found a new scientific home in the institute. He was not the only person I visited on campus: the fellow with me in the photo on the right was one of my office-mates when I was in graduate school in Trieste (Italy). After graduating he worked for a while in Sweden (his interest are theoretical calculations about black hole mergers) and then returned to China where he is now chair of the department. I was very happy to meet him after so many years. He was a very gracious host and walked me around the campus, showing me the architecture and the landscaping, and telling me about the history of the university. We also had some time to talk about his experience of getting back to China after having lived and worked for a long time in Europe. The government is investing a lot in science, and his department is expanding significantly, with new hiring and the development of state-of-the art astronomical facilities. This is something I gathered also from other sources, and that is true in other fields of physics (e.g. particle physics), where both the quantity and quality of Chinese scientific production has greatly improved in recent years (I see that also in my own department faculty and graduate students coming from China). I sometime get asked why somebody would want to move from a more free country (e.g. the Netherlands) to a place with a less democratic form of government. I am in no position to judge: people make their own choice based on their own circumstances, priorities, family constraints. We don't chose the place where we go to live and work in abstract terms: there are many factors that influence our decisions. 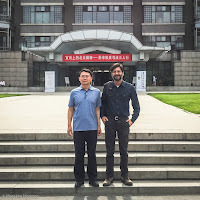 Both my friends are happy to live in Beijing and work in the university: the place definitely shows the kind of dynamism that physics and space science had in the US in the 50s, at the heigh of time when the american government believed and strongly supported science. In other fields it may be different. I heard from some sources that humanities are suffering under a more strict ideological control that is being exerted by the current leadership, in a change with respect to the more laissez-fare attitude of the previous government. Science however appears to still have little central oversight, and a lot of support and funding in today's China.